This is a notebook that uses the GTK+ toolkit. It has similar functionality to the notebook found on the Psion Revo PDA. Since the 0.2 version, it also runs on Ms Windows. 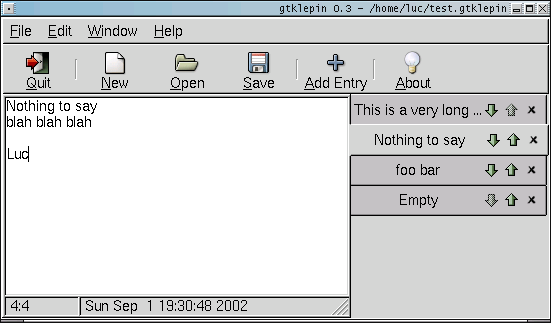 To build gtklepin under windows you can use mingw (use something like "-mno-cygwin -fnative-struct -mwindows -liberty" if you want it to run correctly). You can find gtk+ for windows here. Usually the win32 version is more buggy. You are free to distribute this software under the terms of the GNU General Public License.